A solitary, massive, water-loving, moderately slow growing, monoecious palm. Common in cultivation, locally common in the wild. It has a rough, brown trunk, 18.3 m. (60 ft.) tall, 61 cm. (24 inch) diameter with persistent leaf-bases and spaced ring leaf scars, and massive segmented, pinnate (feather) leaves, 4.6 m. (15 ft.) long, 0.9 m. (3 ft.) wide, dark green above and beneath. Elaeis guineensis can tolerate brief cool conditions. But low temperatures are best avoided, it will not tolerate any duration of dormancy and anything other than the briefest of cold snaps will surely kill a young plant. It naturally occurs in dry, arid, sun exposed, grassland locations, and should be planted to maximise Summer heat & sunshine exposure. Its roots will travel down to find water. Under cold conditions we recommend you keep this palm as dry as possible, which will usually mean constructing a glass or plastic roof over the plant to keep rain off, and supplemental heat provided over duration. 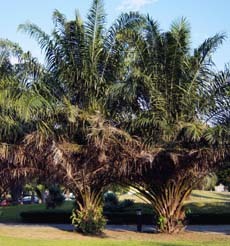 Any cover placed over this palm during times of rain or during cold nights must be removed or vented during hours of sunshine or the plant could be severely heat stressed. 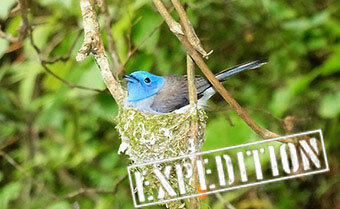 Most numerous as an introduction to Malaysia, where you can see huge palm oil plantations. Palm oil is a cooking oil and a very important commodity.